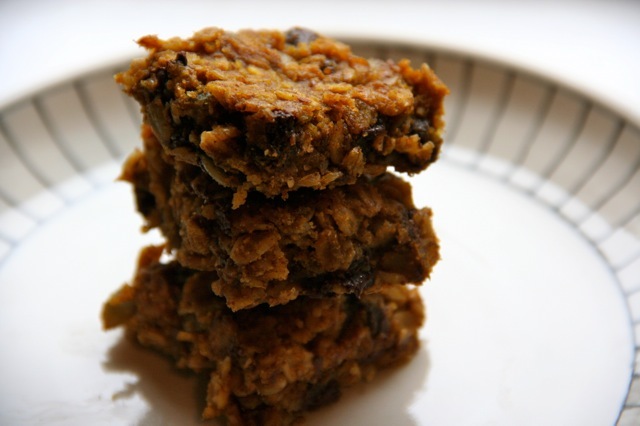 Part three of our food series on the Innate Gear blog, complete with a recipe for pumpkin chocolate bars, which are meant to be shared. Autumn means colder weather, heavy sweaters and the occasional rain jacket. Originally from the Pacific Northwest, I love this seasonal change. In fact, I’m addicted to it. While summer is certainly a cause for celebration, when fall comes knocking at the door I gladly open to let it in, knowing fully well that a warm cup of tea and a good book will follow. Autumn is the time for warming up and slowing down. It’s also harvest season, which with its ample amounts of apples, pumpkins and squash, provides the perfect backdrop for all seasonal adventures. What’s better on a cold hike than a thermos full of apple cider, after all? We sit down to eat together, we pass along a recipe, we share a round of energy bars on the trail; it’s all an act of sharing and giving. Through good food, we take care of ourselves and those around us. It’s a time of comfort food and while we all have a tendency to want to gorge ourselves on heavy carbohydrates, there are plenty of ways to put seasonal delights to good use in something other than casseroles and cookies. Pumpkin is my seasonal ingredient of choice, both for its color and flavor. I’ll add a few tablespoons of pumpkin puree to my morning oatmeal when I want to switch up the flavor, or I’ll dice a fresh one and turn it into a pumpkin curry. Put that in a vacuum food container and take it on your outdoor adventure and you’re sure to win some new friends. Especially as we head into the time of year that’s all about giving, what better thing to pass along than the gift of food? In search of an easy and packable item that was comforting yet still healthy enough that we could feel good about eating it, I set out on the pumpkin route. This one is somewhere in between an energy bar and a cookie, so it’s just as good in the midst of a hike as it is with an afternoon cup of something warm. Oh, and they’re gluten-free and vegan, so you can pretty much share them with all of your friends, no matter what eating restrictions anyone has. 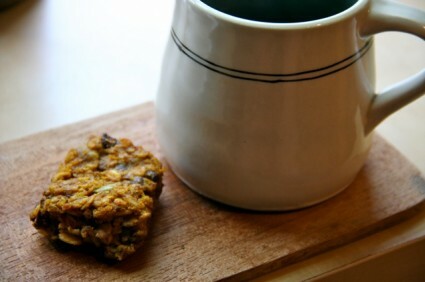 A simple ride in the morning chill followed by coffee and pumpkin bars? You really can’t go wrong. Just be sure to grab that rain jacket. Recipe note: If you want these bars to be 100% gluten-free, you need to make sure you use gluten-free certified oats and dark chocolate that’s vegan – many of them are. In a small bowl, combine ground flaxseeds and warm water. Stir and set aside about 5 minutes to congeal. In a large bowl, stir together pumpkin, spices, sugar, olive oil and vanilla until smooth. Add in the congealed flaxseeds and stir until well blended. Add in the oats and almond meal, followed by pepitas and chocolate. Grease a square 8×8-inch baking pan with a couple of teaspoons of olive oil. Press batter into baking pan so that it fully covers the pan and reaches the sides. Remove from the oven, and using a knife, slice into squares. Let the squares cool in pan before removing. Store in an airtight container in the refrigerator. This post is brought to you buy Innate Gear, maker of reusable products that are meant for travelers. They are part of the essential Foodie Underground travel kit – an always have been – and we are excited to be partnering with them to bring you an exclusive series about sharing food on the trail and during your travels. Wholier-Than-Thou: Is the Kombucha Spiked? These look amazing, I will definitely be making them!